Ahhh, love. This sweet couple represents one more reason we believe love is the most special thing in this world. Seeing Jon and Amy together made us so happy! They comforted and encouraged each other and they couldn't stop holding hands and smiling at one another. Cheddar, their little pooch, cracked us up too. What a cartoon character! As we get to know them, it's more and more obvious that Jon and Amy are perfect together. We can't wait for their 2014 wedding! If there's anything we learned about Jon and Amy right away, it was that they love all things Green Bay Packers and they LOVE to play & snuggle with their dog, Cheddar. He's a true Wisconsin pooch with loads of personality. 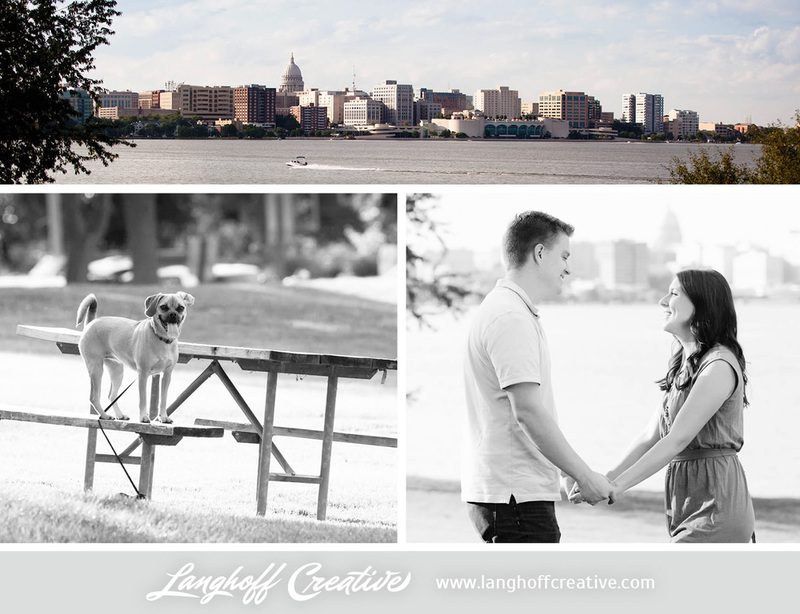 Jon and Amy chose Olin Turville Park in Madison for their engagement session. It has a gorgeous view of Wisconsin's capital building and surrounding areas from across Lake Mendota. Jon graduated from the University of Wisconsin—Madison in 2009 and Amy currently teaches 1st grade in Madison. The city is special to them! Jon and Amy have been together for 3.5 years. I wondered what their secret to keeping their relationship alive was. "We can be silly and dorky together," Amy laughed. "We also have very good communication…we discuss anything and everything. It drives us nuts if we don’t!" The proposal story? SO cute. "It was on Valentine’s Day," Amy described. "I went to the door to grab Cheddar’s leash to take her out and saw the ring clipped to the end of the leash right as I saw him moving to one knee. It was a TOTAL surprise! Then he cooked me dinner and we spent two hours calling our family and friends to spread the news." On May 10, 2014 Jon and Amy will be getting married at St. Anthony on the Lake Catholic Church in Pewaukee, WI (where Amy grew up attending). Their fancy reception will be held at Seven Seas in Hartland, WI. They're most looking forward to the lakeside bonfire feature at their reception! "It's perfect for us as a couple because of how much we love campfires. We have lots of memories up north with family around the fire." Amy says their time of planning has been very laid back and has come together easily. Jon and Amy met through a mutual friend a year before they started dating. She would get a group together to go out downtown so the first few times they met were at different bars in Madison. "I remember thinking he was awesome right away… the type of guy who tried to cheer everyone up," Amy gushed. "Jon was in a long relationship with someone else at the time [we met] and I remember being very bummed about that," Amy explained. "We kind of lost touch for a few months until good ole’ Facebook told me he was 'single'. After that we went on three dates three nights in a row and have been together ever since!" "My favorite thing about Amy is how caring and considerate she is to everyone else’s feelings and how much fun we have together," Jon said. Amy said, "My favorite thing about Jon is his sense of humor. He’s always making me laugh and brightening the mood with his energy." Jon and Amy told us they love to spend time with family and friends, traveling, cooking and trying new recipes, and relaxing at home together. One of Jon and Amy's favorite memories together is their One Year Anniversary in January of 2011. "We went to a bed and breakfast and it was such a cozy, old-fashioned place. It felt like something out of a movie! There was a fireplace with a view of the bright, frozen lake. It was very romantic to be there together in a completely different setting than we were used to!" I asked them what they were most looking forward to about being married. Their response was perfect. "Having a best friend by my side through every step of life, making memories with our future family, going new places and trying new things." Congratulations again on your engagement, you two. Your wedding celebration next May is going to be unbelievable. We're counting the days…. (242 in case you were curious)!